Remotely monitoring vehicle systems to provide cost-saving preventative maintenance is more attainable than ever. Rob Orchard learns about the innovative AD Connected process for cloud-based vehicle inspection, servicing and maintenance records. Alexander Dennis Ltd (ADL), Britain’s biggest bus and coach manufacturer, is a past master at introducing innovative new vehicles but their latest product is something very different – AD Connected. It is a radical new, cloud-based, on-line fleet management and pre-emptive diagnostic system. The system underpins ADLs commitment to embrace the latest technology to help it remain market leader in terms of customer support. You don’t even need to operate ADL vehicles to use the system because it has been designed to cover all modern vehicles and all sizes of fleet. ADL has spent the last two years developing and honing the system working very closely with many of the country’s leading operators, both large and small. One of the great features of the system is that it can be tailored to your exact requirements. George McAdam, ADL’s Group Quality and Aftermarket Director, who is responsible for the AD Connected system, describes it as being a Pick and Mix of a whole raft of features which can be set up to give you the operator the information you need and give it quickly and accurately. AD Connected transforms the traditional approach to vehicle inspection by providing the most in-depth level of operational analysis and preventative diagnostics on the market. The cloud-based system provides a clear, concise pathway, linking direct to operators either by registration, fleet or chassis number. The system has various support approaches that can be tailored to each operator’s need. It operates across the whole fleet range rather than be restricted to one product or commodity type. Touchscreen menus and tablet computers simplify the whole process, enabling engineers and inspectors to move quickly and methodically around a vehicle, scrolling through options and selecting the easy to use icons. Previous vehicle issues and recorded fault codes are also displayed on a ‘ruggedised’ tablet to provide a preventative maintenance guide, allowing operators to carry out preventive repairs before the problem develops into a major event which is likely to put the vehicle out of service. It is also an instant system, in that when the engineer carries out a compliance check, the information is fed immediately to the back office and any potential problems can be quickly dealt with. You can either use the system’s in-built recording system, devise your own or even use the DVSA Compliance descriptions, safe in the knowledge that whatever system you decide on the in-built AD Connected system will ensure total DVSA Compliance and avoid optionism. There is also the option to add text notes, images and video recordings that can assist engineering teams and mechanics to initiate modifications and repairs quickly. The system has the flexibility to be customised to meet the needs of individuals and the ADL Aftermarket team will work with operators to set the system up to their individual requirements and make sure they realise maximum benefit from the system. 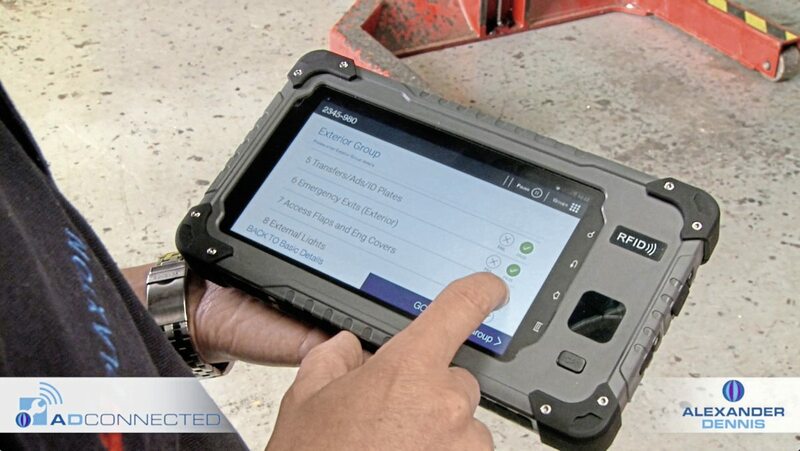 After completing vehicle checks, AD Connected synchronises data to the main system giving engineers immediate access to accurate information through web applications. Faults are scrutinised, organised and incorporated in a report that highlights how vehicle performance can be improved and in service time maximised. On the web application, operators can also access a dashboard that enables them to view live information, service management and diagnostics, along with current vehicle status reports. Other AD Connected options include a comprehensive telematics suite providing in-depth, live vehicle data on faults, predictions and recommended actions, fuel and driver performance. The system can even go as far as placing an order for a replacement part with ADL Any Make Parts programme. But remember that authority levels can be set at whatever level the operator decides and can be modified at any time. On behalf of his team Darren Cox, Aftermarket Development Director; Craig King, Aftermarket Development Manager and Kenny Dickson, Aftermarket Project Director, George McAdam said: “AD Connected is an exciting bus industry first and we are delighted to be leading the way with this breakthrough technology. We have developed it in conjunction with customers such as trentbarton, Blackpool Transport, Stagecoach Group and Whitelaw’s Coaches and along with key providers in our supply chain network. I am grateful to all those who have participated in this crucial development phase. ADL has also developed a new All Makes Parts ordering website designed to make it simpler to find the correct parts. The images are simplified, clean and clear to avoid confusion and details of other parts that might be needed, e.g. gaskets are also shown. It also details any bulletins that have been issued concerning the part. Another new device being launched by ADL is AD Protect which is a bridge warning system that uses geo-fencing to trigger an audible alarm for drivers on the approach to low-height hazards.